If you haven’t checked out the most recent offering from the BBC, I suggest you get onto it quickly and get ready to squee! 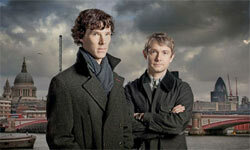 Sherlock is a contemporary update of the classic story of Sherlock Holmes by Arthur Conan Doyle. With creators and writers of Dr Who fame, Steven Moffat and Mark Gatiss, this show was set to be brilliant – and it is! The series is loosely based on Doyle’s stories and has all the characters we are familiar with. It is clever, witty and very fun! 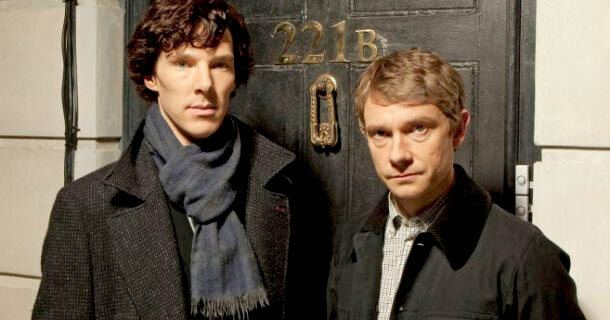 The show stars Benedict Cumberbatch as Sherlock Holmes and Martin Freeman as Dr John Watson. Both actors do a fantastic job of portraying their characters. Cumberbatch is particularly squee worthy as the charismatic Shelock and Freeman has always been lovable in his roles. The show has just finished being aired in a 3 part mini series on BBC1 and is set to air on Channel 9 in Australia sometime later this year. Going by it’s popular reception in the UK (up to 9.23 million viewers for the first episode, “A Study in Pink”) – and the ending of the third episode, further episodes were pretty much a guarantee, either in the version of more mini series episodes or a longer regular series. It was confirmed by the BBC on the 11th August, that Sherlock has been renewed for a second season, and Moffat has stated that the show will retain it’s 90-minute format. Squee! If you’re wanting to catch up on Sherlock you can buy Sherlock: Season One on DVD or Blu-ray from Amazon.